As trash piled up on the National Mall and parks across the country were closed to visitors, one Washington, D.C. site run by the National Park Service (NPS) was open to the public during the government shutdown: the Old Post Office Tower attached to the Trump International Hotel. Today, American Oversight filed a lawsuit against General Services Administration (GSA) and the NPS to shed light on the decision to use federal funding to re-open the Old Post Office Tower during the longest government shutdown in U.S. history. President Trump maintains a financial stake in the hotel and has refused to divest from his businesses. The recent 35-day shutdown closed numerous federal agencies and kept hundreds of thousands of federal workers from receiving paychecks. Funding for certain functions of GSA, which manages the Old Post Office Tower on behalf of the federal government, and NPS, which runs the site, lapsed during the shutdown, but the administration made the decision to finance the tower’s operations. GSA issued various statements concerning the Federal Buildings Fund and the use of funds not impacted by the shutdown to fund operations at the Old Post Office Tower, but it remains unclear why and who made the decision to re-open the tower. During the second week of the shutdown, American Oversight filed a series of Freedom of Information Act (FOIA) requests to GSA and NPS seeking communications about the Old Post Office Tower during the government shutdown, including communications with anyone at the White House or the Trump Organization. American Oversight is also seeking records regarding the source of funds to operate the Old Post Office Tower during the shutdown, as well as records of any legal analysis of how the lapse in appropriations would impact those operations. GSA and NPS have both failed to produce these records. Once again, the president’s failure to divest from his businesses creates conflicts of interest. We’ve been investigating President Trump’s businesses and the ways in which he profits from the presidency since 2017. 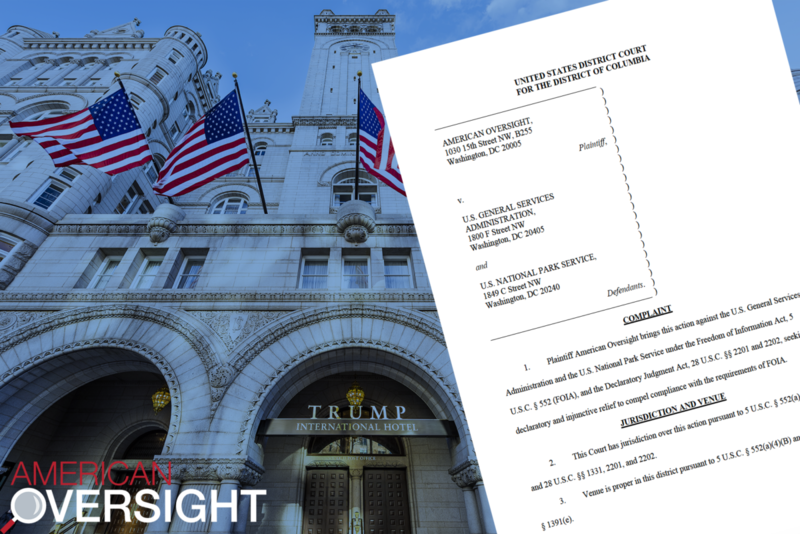 American Oversight recently filed another lawsuit to find out if President Trump interfered with plans to move the FBI headquarters, which sits a block away from the Trump Hotel, possibly in order to prevent future competition. Given the recent Inspector General report finding that GSA ignored the Constitution when deciding to allow the Trump International Hotel to maintain its lease on the Old Post Office building even after Donald Trump became president, we want to know if legal and ethical considerations may have been overlooked in this case as well.